Religion and Politics in Bahrain: Bahrain's Other "Silent Majority"
A scene from Friday's rally at the Al-Fatih Mosque. Bahrain's Sunnis are mobilizing too. If you didn't know better, you might be tempted to say that despite months of political dialogue, societal reconciliation, and now post-BICI "reform," Bahrain hasn't actually succeeded in resolving much of anything, whether in politics or in society. The images and video from the weekend's "Occupy Budaiyi' Road" sit-in/protest are by now familiar enough--indeed, are now almost so routine as to require little by way of description. Citizens continue to engage in acts of protest, including road sabotage using oil and other projectiles. The state continues to deploy security forces to confront (or preempt) these activities. These security services continue to disperse crowds with tear gas, percussion grenades, and, at least in the case of Zainab al-Khawajah, forced removal. The U.S. condemns the actions of security forces and protesters. At least one protester dies. The government vows to investigate. A funeral is held. The funeral turns into a political march. Repeat. All the while, Bahrain's economy continues to suffer. The IMF predicts Bahrain’s economy to grow by only 1.5% of GDP this year, its lowest rate since 2008, and increase to 3.6% in 2012. Yet because of the disproportionate impact of oil exports, these aggregate figures obscure the reality of a struggling private sector and rampant unemployment. Despite a significantly calmer political environment, output from Bahrain’s real estate sector fell an inflation-adjusted 5.6% in the third quarter, hotels 8.7%. Indeed, according to a survey by Ernst and Young, Bahrain's "hotels reported a 60 per cent drop in business in the first eight months of 2011." Even more marked is the continuing impact of political uncertainty on Bahrain’s banking sector, which Moody’s downgraded to a negative outlook in May. Assets within its wholesale banks, which account for almost 90% of total banking assets, had by the end of August fallen by 14.5% since the start of the year. While Bahrain’s central bank insists the change reflects ordinary moves in where banks book assets rather than a deliberate shift away from Bahrain; and while no large institutions have quit Bahrain outright, still the drop is a serious blow for an economy that fancies itself the region’s finance hub. 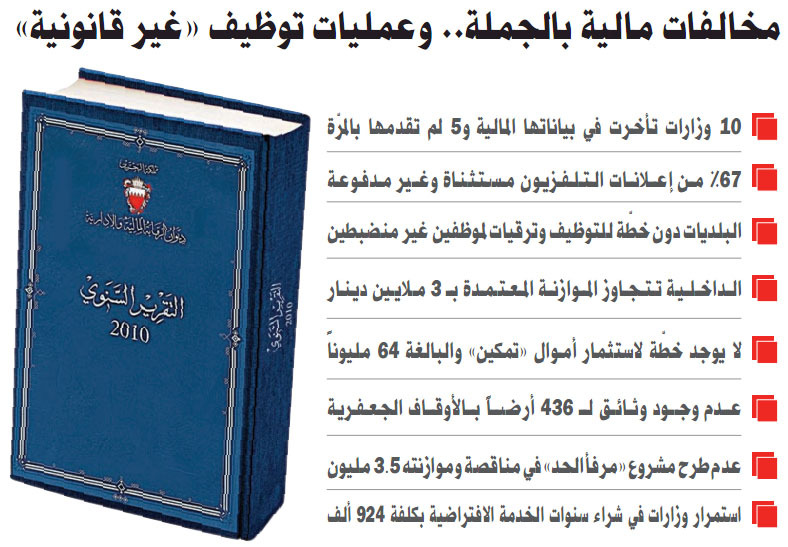 Bahrain’s wait-list for public housing recently surpassed 50,000 applicants, some having registered as early as 1992. To finance these and other badly-needed public works projects, Bahrain in November sold $750 million in seven-year Islamic bonds in an offering postponed since March as its debt insurance costs hit 18-month highs. According to its central bank governor, Bahrain’s budget deficit is currently about 5% of GDP, which may require oil prices above $100 per barrel to balance. Despite the implicit promise of financial support from Saudi Arabia in the case of real emergency, Bahrain’s fiscal situation remains precarious. Of course, any additional financial reliance upon Saudi Arabia beyond its already-enormous subsidization of Bahrain's annual budget will only further erode Bahrain's autonomy in the political and security spheres. Until now, Bahraini Sunnis unsympathetic to the protest movement have understandably blamed the latter for the country's precarious economic situation. "If only these political troublemakers would get off the streets and make some compromise like reasonable people," the logic has gone, "then everyone could go back to making a living." Or, perhaps more accurately for many: "If only the government would finally wipe the floor with these people, then everyone could go back to making a living." While the second position has occasioned no little criticism of King Hamad's handling of the crisis, still the underlying blame remains with protesters themselves. Lately, however--say, since the release of the BICI report--the thinking among many Sunnis seems to have shifted toward a position more critical of the government independent of its response to protesters. This has been predicated on the realization that, even if today's crisis were to go away, the political status quo ante wasn't really such a great deal for Sunnis anyway. Corruption and speculation fuel high property prices and housing shortages; the economy is by far the weakest in the GCC; and the country is structurally dependent upon Western backers, foreign tourists seeking alcohol and women, and Arab and Pakistani immigrants given free citizenship in return for serving in the armed forces. Not only is Bahraini national identity being diluted and its society corrupted, many Sunnis note, but this influx of foreigners contributes even more to the country's housing shortage and overall fiscal burden. Most fundamentally--and here I recall a point made at length in the previous post--the country's Sunnis remain for the government a captive ethno-religious constituency whose political support is taken for granted. The state knows that fear of inadvertent Shi'a empowerment serves to dissuade Sunnis from demanding political reforms that they might otherwise desire. At the same time, Sunnis understand that the bulk of the state's political energy and financial resources inevitably will be directed at heading off Shi'a demands for the same. The Sunnis of Bahrain are in this way stuck in a system that rewards them disproportionately little for their continued political support, but one they are loath to change. The most recent cause for Sunni complaint is found in the annual publication of the National Audit Court (NAC), a yearly review of public-sector waist and impropriety. Each year its findings tend to spark temporary outrage, are discussed in parliament until its members realize they lack the power to rectify any wrongdoing anyway, and then is promptly forgotten until next year. No explicit mechanism exists to hold offending agencies or individuals responsible. Al-Ayam has produced an executive summary of this year's (i.e., the 2010) report, including the bullet point-worthy findings enumerated above. These include, e.g., "67% of television advertisements are unpaid"; "the interior [ministry] exceeds its specified budget by 3 million dinars"; and best of all: "10 ministries were late in reporting financial data [for the NAC] and 5 didn't submit any at all." Couldn’t you have found a better time than this to publish the Audit report ? Come on pals! Why bring to the fore what we were trying to ignore?! Did you choose this timing to publish the report to spoil our celebration of our national days!? You could have submitted this report to the deputies a month ago or delayed it till after the holiday so as not to spoil our national days with heart-sickening news. Didn’t you know that our hearts are already grief-stricken? Hardly had we caught our breath after the BICI report than the report of the Audit report came as a blow. One report after another! Have mercy on us guys! Too many strokes-may God keep evil away! We tell the honorable man Mr. Hassan Al-Jalahma, the National Audit Court Chairman: “Enough is enough! We have had enough problems! We can’t bear it anymore. Mr. Chairman, why make all this effort and waste all this time if the report would not help to remedy the situation or transfer the offenders to the Attorney General and the judiciary? Why all these scandals when there are no solutions or if we do not send those who commit violations and irregularities to prison? We are tired! Every year, we read about scandals and the transgressors are not held accountable; nothing happens! And the following report for the following year comes as a heavier blow with more violations and more scandals and more corruption!! Yet, there is much movement in the country: people are living comfortably and have much money and have the art and skill of taking from the funds of the State as long as there is no one to hold them responsible for that and ask them: “How did you get it?” To state things in a more explicit way, if the state does not take a strong and decisive action to stop this waste of public money, that will spark the unexpected, and we [read: we Sunnis] will be locked in. There are categories that believe in the need to have a major, outstanding and influential role in shaping the Rally’s attitudes and work styles. Among these categories are the youth who have undergone a radical transformation due to the crisis that swept the country and believe they should have a role in political life and believe, so far at least, that there is no entity capable of effectively and clearly accommodating them. We need a general national conference to discuss the role the National Unity Rally can play in shaping the future of Bahrain, assess the challenges and the Rally’s state at home and abroad and set future frames to guarantee more efficacy, success and influence inside the political system. The conference shouldn’t exclusively include the Rally’s cadres but all the components of society as well as independent figures and some political forces close in their views to the Rally. Such an idea will prove futile unless there is an outspoken admission by the Rally’s leadership of the challenges they are currently facing. Besides, there should be a national partnership to share the responsibility of maintaining the equation of the new forces in the Bahraini political system following the crisis. The suggestion is therefore that Bahrain's Sunnis should not and cannot return to the previous political order following the (possible eventual) resolution of the current crisis. 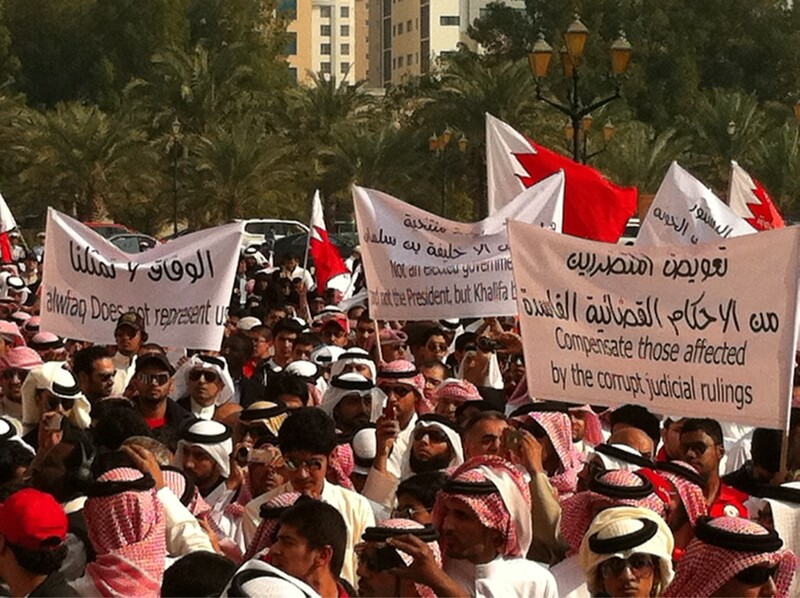 While it is usually pro-government Shi'a that writers in Al-Watan refer to disingenuously as Bahrain's "silent majority," here Al Bin Khalil's "silent majority" goes hand in hand with the "new forces in the Bahraini political system," both of which are clear euphemisms for Sunni activism, whether this be centered around the National Unity Gathering or some other society. The prospect that Bahrain's three Sunni Islamic societies--representing the Muslim Brotherhood, Salafis, and Sunni nationalists in the NGU--might attempt to coordinate their political programs must be more than a little unsettling to the Al Khalifa. With a Shi'a-led opposition the state knows how to deal; concerted political mobilization among Bahraini Sunnis is a much more novel--and more dangerous--development. Update: In case you were wondering what was going on at this week's GCC summit in Riyadh, evidently prominent on their agenda is "accelerating regional turmoil," this according to the Gulf Daily News. Hey, at least they are being honest. "Responses to unwanted authority in early Islam: models for current Shi‘i and Sunni activists." "Early Hanbalism and the Shi‘a." "The confrontation between Sunni and Shi`i empires: Ottoman-Safavid relations between the fourteenth and the seventeenth century." "Encounters between Shi‘i and Sunni ‘ulama’ in Ottoman Iraq." "The Ottoman Dilemma in handling the Shi`i Challenge in Nineteenth-Century Iraq." "Religious extremism and ecumenical tendencies in modern Iraqi Shi‘ism." "Quietists turned activists: the Shi‘i revolution in Iraq." "The Sunni-Shi‘i struggle over Lebanon: a new chapter in the history of Lebanon." "The Wahhabiya and Shi‘ism, from 1744/45 to 2008." "Unity or hegemony? Iranian attitudes to the Sunni-Shi‘i divide." "Debating the 'awakening shi‘a': Sunni perceptions of the Iranian Revolution." "Interesting times: Egypt and Shi‘ism at the beginning of the twenty-first century." Act now as Amazon says it has only 1 copy left! Update 2: Asks Marc Lynch in Foreign Policy: "Will the GCC Stay on Top?" Update 3: As reported by Human Rights Watch, the Bahraini Lawyers' Society is the latest victim of the state's tried and true strategy of internal administrative coup. The body's recent elections on November 26 have been overturned by (ironically) the Minister for Human Rights and Social Development, and the previous post-crackdown, pro-government regime has been reinstated. This same technique of dealing with potentially critical civil society entities has been witnessed already of course, most recently in the cases of, e.g., Al-Wasat and Wa'ad. Indeed, even before the uprising the same strategy was in place. In September 2010, for instance, the board of Bahrain's oldest human rights group, the Bahrain Human Rights Society, was dissolved and given government-appointed replacements. Update 4: (Cf. Update 2) The GCC's--or Saudi Arabia's--latest grandiose initiative is to push the bloc toward further political unity: a "single entity," as per King 'Abdallah's opening remarks at the GCC conference in Riyadh. Yet, as member states can't even implement a single GCC currency due to internal rivalries and lack of political will, I won't be holding my breath waiting for the United Arab States. Update 5: The Ministry for Human Rights and Social Development has hit back at Human Rights Watch for its report on the Lawyers' Society elections (Update 3). Just curious -- where is al-Jam3iya al-Islamiya in all of this? The trend informally represented by people like Al Mahmood and Naji Al Arabi. Do you know if it has a formal role in the meetings like Asala and Menbar? Ironically , this same "same silent majority" complains that their political leaders in the three societies mentiond are puppets to the government , but the voice is usually divided between those who make lighter demands for the sake of (sunni) political unity and the more outspoken ones who gained greater prominence in the crisis.In any case the sunni point of view ( wether from political societes or from normal individuals) is notoriously divided and the government likes it that way , which is why it plays on the ropes of normal people and political societies as well(leading to the divide in opinions and the status quo). @Chanad: I haven't heard, and I'm not sure how one would find out? @Ahmad: You're right that the Sunni voice has historically been divided, which is why Al Mahmud's reference to a meeting involving the NUG, al-Asalah, and al-Manbar is such an interesting development. To what extent this represents anything more than a desire for "Sunni inclusion" in the presumed negotiations involving al-Wifaq and the government, we will find out. And, of course, all of this excludes discussion of tribal Sunnis who are unlikely to sway from their longstanding--as in hundreds of years of--support for the Al Khalifa. Where it this silent majority now?! or do they awaken only when the real majority speakout ?? plus how can there be "another" majority ? there can be only one single majority.. the rest would be considered minority ! there cant be two majorities !